Danny Malik batting for Peterborough Town in the National Cup over High Wycombe. Peterborough Town are back on the National Cup glory trail at Bretton Gate on Sunday (July 15, 1pm). The city side take on Essex Premier Division outfit Brentwood in a last-16 tie hoping for more of the same after a dramatic one-run win over High Wycombe at the same venue in the previous round. That win arrived as seamer Kieran Jones and slow bowler Danny Malik claimed seven wickets for one run in 11 remarkable deliveries, a finish that earned national recognition. Jones is unlikely to play this weekend unless star men Rob Sayer and Lewis Bruce are again unavailable. Brentwood are currently fourth in their own county league, but they toppled crack Norfolk-based side Swardeston in the last national round so they will be a tough nut to crack. This is the furthest Town have ever travelled in the National Cup and if off-spinner Sayer is able to join forces with his younger brother David, a rapidly improving fast bowler, they could move into the quarter finals. 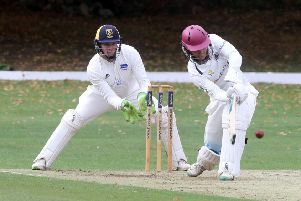 Before then Town will seek to close the gap on top two Finedon and Old Northamptonians in the Northants Premier Division by beating Rushden at Bretton Gate tomorrow (July 14, noon). Town were surprisingly beaten in this fixture last season when Rushden overseas star Chunaka Ruwansiri delivered an exceptional batting performance. He is still at the club. Old Northamptonians lost for the first time last weekend, but they and Town have been hit by the withdrawal of Rushton from the Premier Division. Rushton finished second last season, but subsequently suffered the loss of numerous first team players. Their record has now been expunged which means Town and ONs lose 20 points, whereas Finedon’s scheduled fixture with Rushton had been abandoned. Finedon are now 17 points clear of ONs and 25 points clear of third placed Town. Slow bowler Richard Kendall is unavailable for Town this weekend, but recent signing Ed Alexander should get another opportunity to impress as an opening batsman. Premier Division (noon): Brixworth v Oundle, Peterborough Town v Rushden. (Noon): Louth v Bourne, Market Deeping v Scunthorpe. Division One (12.30pm): Ramsey v Kimbolton, Wisbech v Histon. Division Two (12.30pm): Castor v Cambridge St Giles, Saffron Walden 2nds v Ufford Park, Stamford Town v Great Shelford. Division One (1pm): Grantham v Ketton Sports, King’s Keys v Weldon, Wisbech v Peterborough Town.